If you’ve played with an Arduino, you’ve probably been frustrated by the IDE. It works, but it’s not the best editor. It’s especially painful for bigger files and larger projects. The Stino plugin for Sublime Text aims to solve this issue by bringing the full functionality of the Arduino IDE to the Sublime Text editor. Sublime Text is a powerful text editor with support for most programming languages. What it’s missing is support for compiling and uploading code to an Arduino. Stino bridges that gap. Sublime is a commercial product, and retails for $70 USD. However Sublime does have an indefinite trial period, so Stino can be evaluated for free. Stino itself is an open source plugin written in Python, and you can contribute to the project on Github. After installing Sublime and Stino, you point the plugin at an Arduino install folder. It then allows you to build and flash directly from the editor. For anyone who’s been frustrated with the Arduino IDE, this looks like a slick solution. [Roman Rolinsky] wanted to try to do something interesting with his Raspberry Pi and a 2.4″ LCD he had laying about… So he made a rather bulky version of Google Glass. We’ve seen a few examples of home brew Google Glass before, or even real-life subtitle glasses used for translation on the fly, but what we really like about [Roman’s] project (besides the fact he hosted it on our very own awesome project hosting site) is that he’s put together the projection system himself out of basic components. To create the HUD, he’s using a semi-transparent mirror which he took out of a game of Khet 2.0 called the Eye of Horus Beamsplitter — which is a really cool real-life puzzle board game like those games where you have to reflect the laser to solve a puzzle. He’s then using a 3x Fresnel magnification lens which is placed over top of his 2.4″ LCD in a 3D printed enclosure. This magnifies and reflects the image onto the mirror which is placed directly over his eye, allowing for a see through display. Stick around after the break to see a video of the Raspberry Eye in action! [Jeff Laughton] was contacted by a customer that was interested in adding some automated functions to a printing press. Before eventually settling on a microcontroller for the job, [Jeff] went old school and started looking at logic gates, counters, and flip-flops. This lead him to the Motorola 14500 industrial control unit, a minimal processor with only 16 instructions. After a few ‘back of the napkin’ sketches, he came up with an extremely minimal computer that doesn’t use a microprocessor. It’s an interesting design notable not only for its electronic brevity, but also because it only uses one instruction. The only instruction this computer will ever execute is an input test, the result of which controls a two-way branch. Instructions consist of an input address, output address, and a single bit of data. If the data bit is true, the computer jumps to one location in ROM, and if the data bit is false, a jump to another location is executed. A computer really isn’t a computer without some form of memory, and this design is no exception. [Jeff] managed to add two bits of data between the 8-bit latch and 8-bit multiplexer in the design. This is enough to call a few subroutines which test the I/O-mapped memory to decide what the next instruction should be. It’s a truly bizarre design, but actually much closer to a true Turing machine than the computers in your pocket, on your wrist, on your desk, and in your car. [Till Handel] just put the finishing touches on a paper he wrote about how to build a cheap 3D scanner — mostly out of spare parts. Using parts from old printers and notebooks, he’s cobbled together this rather rough-looking laser scanner. But don’t be fooled by its looks! It’s capable of scanning 360° around itself at distances from 0.3 – 5m, making it an excellent candidate for scanning rooms. It uses a line laser and a webcam mounted on an arm driven by a stepper motor, which looks like it’s out of an old optical drive. 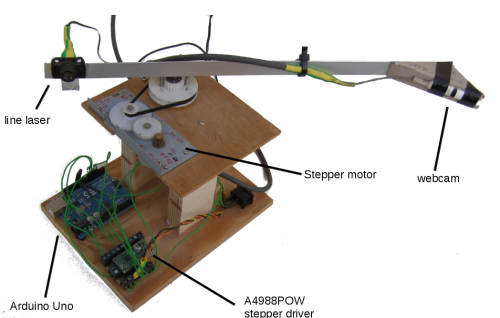 An Arduino Uno and an A4988POW stepper driver control the system. The paper (Caution: PDF) is very detailed and published under GPLv3 (a general public license).